1. Counteracting putrefaction; such as, decay, fetid odor, rot, and decomposition. 2. Counteracting, or preserving from, putrefaction; an antiseptic. Could this apply to other areas; such as, athletes, writers, entertainers, love affairs, business enterprises, the stock market, and popularity? Not putrescible or subject to decomposition, decay, or putrefaction; incorruptible: "They used a tanning process to make imputrescible skins." Proceeding from putrefaction, or taking part in the putrefactive process; having an offensive smell; stinking; rotten. 1. Decomposition or rotting, the breakdown of organic matter usually by bacterial action, resulting in the formation of other substances of less complex constitution with the evolution of ammonia or its derivatives and hydrogen sulfide; characterized usually by the presence of toxic or malodorous products; decay; decomposition. 2. The decomposition of organic matter; especially, the typically anaerobic splitting of protein by bacteria and fungi with the formation of foul-smelling and poisonous products; such as the ptomaines, mercaptans, and hydrogen sulfide. The process of breaking down by bacterial action; decay. Putrefaction is a complex phenomenon involving a multiplicity of chemical reactions, always accompanied by, and without doubt caused by, bacteria and vibriones; hence, putrefaction is a form of fermentation, and is sometimes called putrefaction fermentative. Putrefaction is not possible under conditions that preclude the development of living organisms. Many of the products of putrefaction are powerful poisons, and are called cadaveric poisons, or ptomaines. 1. A reference to or relating to putrefaction or to being rotten. 2. Causing or tending to promote putrefaction or decay. Anything which is liable to decay or to spoil or to become putrid. That which makes something rotten or causes decomposition and decay; often with malodorous results. 1. Referring to something that is decaying or rotting: The employees of the grocery store had to get rid of the putrescent fruits and vegetables before it opened for its customers. 2. 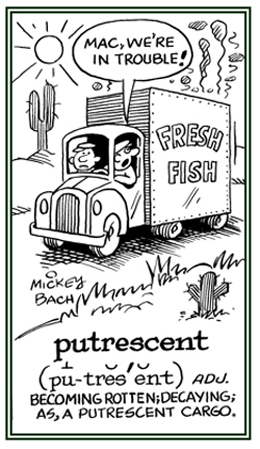 Etymology: from Latin putrescentem; from putrescere, "to grow rotten" from putrere, "to be rotten." © ALL rights are reserved. Gangrene of the uterus, a severe form of acute endometritis. Word families with similar applications about: "decay, rotten; wasting away; putrid, pus" word units: phthisio- (decay, waste away); puro- (pus); pus (viscous fluid via an infection); pustu- (blister, pimple); pyo- (pus; purulent); sapro- (rotten, putrid, putrefaction, decay); sepsi- (decay, rot, putrefactive); suppurant- (festering, forming or discharging pus); tabe- (wasting away, decaying).